An essential resource for the most creative of teachers, our Pom Poms Assorted Woolly 100 Pack easily enhance any crafting project. A sizeable pack that has something in it for everyone, these soft to touch balls are perfect for everyone from nursery and primary school children through to adults. Great for everything from collaging to decoupage, each fluffy ball works well with all manner of adhesives including basic PVA glue through to sewing equipment. The large pack is wrapped in a secure bag for safe storage when not in use which also ensures each pom pom is in the perfect condition for use. 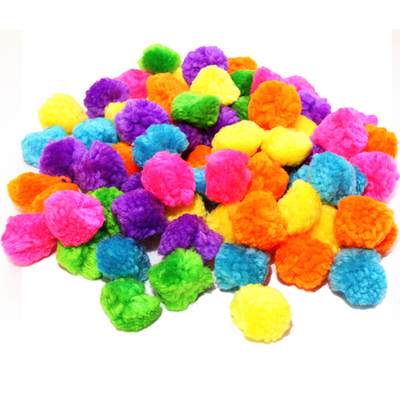 We also have pom poms in an assorted glitter pack of 100 and other craft resources such as Buttons and Ribbons.